Description of "International Journal Of Basic and Applied Physiology, vol-2,issue-1"
This is the second volume of International Journal of basic and Applied Physiology being published annually. 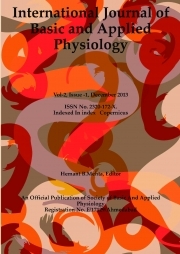 This Journal is Published by Society of Basic and Applied physiology( Registered). It aims at establishing highest standards of scientific publications comparable to world levels. The Journal never charges any sort of direct or indirect fees from authors/scientists. The Editor in Chief Dr. Hemant B. Mehta is working as Professor and Head of the Department of Physiology at Govt medical college, Bhavnagar, Gujarat, India , since many years and is renowned academician and research worker in the field of Physiology. He is known for his sincerity, honesty and hard work. That is the reason why this great responsibility of Editor in chief has been put on his shoulders by The Society of Basic and Applied Physiology. Reviews of "International Journal Of Basic and Applied Physiology, vol-2,issue-1"